Adornments in Zebra Design. Cute accents for our clear high heel shoe container or any gift wrapped package. Simply attach a bit of Sticky Doo to the back side of the adornment then attach to your choice of container or package. 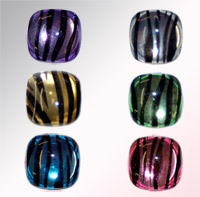 Several zebra colors to choose from.